The Verdi Chair Light Grey is an opulent design that invites you and your guests to sit back and relax. With undeniable traditional appeal and luxurious levels of comfort, the Verdi Chair fuses past and present style influences with unquestionable success. Sprung and belted for premium comfort, the plush seat and padded backrest offer much-needed support, all upholstered in lovely light grey fabric. 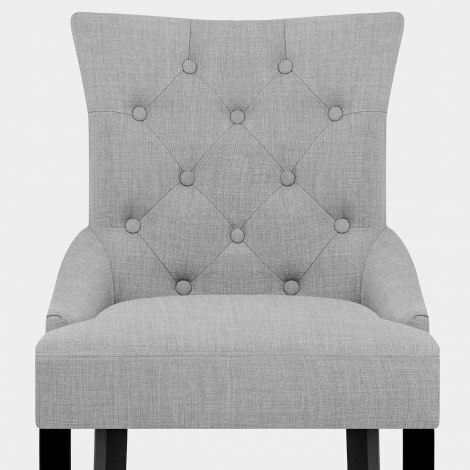 Plus, the elegant button detailing in the backrest along with trendy wraparound sides lend a chic luxury aesthetic. Crafted from a solid wooden frame for a sturdy and strong base, the quartet of legs possess a timeless black finish that contrasts beautifully with the pale colour of the seat. "Fantastic! Love my new chairs, quality is great"
Really delighted with my new chairs. Easy to assemble and true to colour and sturdy. 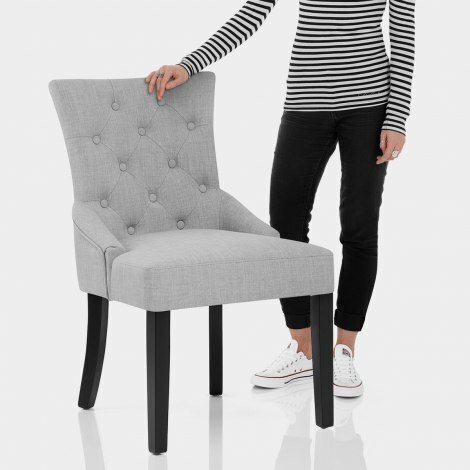 Found this website by chance and looked at a wide range of chairs for a while. Decided to travel to their showroom from London and well worth the visit. Helpful team with great service. Chosen chairs were easy to set up, they are of good quality and look lovely. Next day delivery was brilliant. Would definitely recommend going to their showroom. Very happy with Atlantic shopping. Super simple to put together, which is great because my husband left me to it... and look great in my new kitchen. I was concerned the grey wasn’t going to be quite right (hence, I bought just one) but they work perfectly. They’re way more comfortable than anticipated - I’ve been disappointed with far more expensive options from a variety of stores since I started looking - slightly horrified by prices out there and the fact I need (want?) 10 - but I think you’d struggle for a better chair for the price! Generous padding, good support, a nice weight, overall I’m really happy. Delivery process was excellent and quick. I’m going to complete the set now!